An amputee puts increase stress on the joint(s) nearest to the amputation level. For a below knee amputee, the knee joint of the residual limb experiences increased stress, as well as the increased stress placed on the ‘sound’ limb, which most amputees favor. 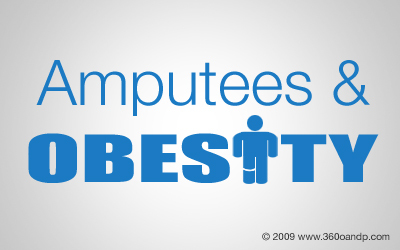 If a below knee amputee is obese, even more stress is placed on the residual limb knee joint. Each prosthetic knee and foot is designed to accommodate certain body weights. Having more body mass requires more pump blood and oxygen through that body. People dealing with amputation and obesity experience compounded cardiac demand and stress on the heart. Many obese amputees may be tempted to reduce activity, due to this increase stress. This reduction in activity will only perpetuate additional weight gain and keep the amputee in a cycle of inactivity. A lower extremity prosthetic socket is fit to distribute pressure throughout the residual limb, and focuses on certain optimal areas for weight bearing and stability. For instance, an above knee prosthetic ischial containment socket ‘locks’ onto the tuberosity of the ischium, which can be found on each side of the pelvic outlet and are the bones that people ‘sit’ on. The better hold the socket has on this pelvic bone, the more secure the socket will fit. Now, imagine that there is an abundance of soft tissue surrounding that ischium bone. Tissue moves and so the result is extra play between the bone and the socket, which decreases stability. As with the prosthetic feet and knees, the materials used for a socket withstanding 300 lbs must be heavy-duty. The result: a heavier socket with a thicker frame. Once the weight has stabilized, a socket replacement may be indicated. The temporary inconvenience of a possible socket replacement is well worth the benefit of living an active life at a healthy weight. Understanding the unique ways obesity negatively affects prosthetic rehabilitation, it is imperative for amputees to work closely with physicians to design balanced meal plans and explore safe, effective forms of exercise.